This research project will analyse lantern slide sets about European countries in the collection of EYE Film Institute Netherlands and University Museum Utrecht as well as in various private collections. These slide sets, produced in different countries, will provide the starting point to investigate visual knowledge that circulated across Europe about other countries and people, including the question of national stereotyping. 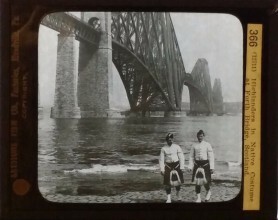 Image credits: “Highlanders in Native Costume”: image taken from eBay, seller ‘alboxman’, 30.07.2015.